Docket: Four-in-Art #3 Reveal! 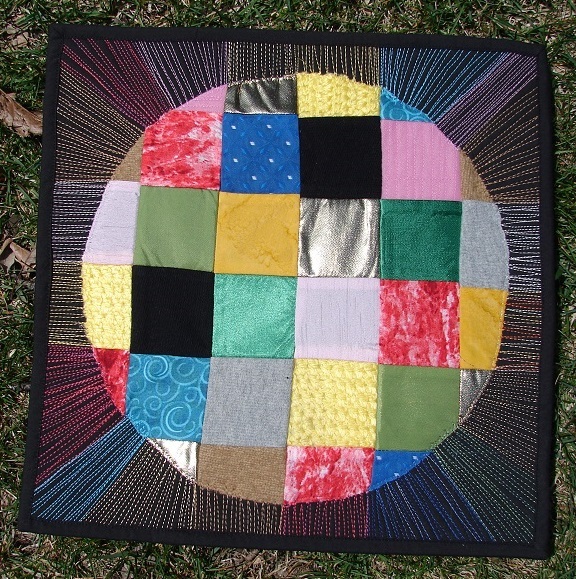 | OccasionalPiece--Quilt! Posted on May 1, 2013 by Elizabeth E.
While no one really knows how the prophet Abraham came to know God, many a rabbi has told a tale, a midrash, about this event. One famous one is how Abraham came upon a castle alight — a castle doleket. According to many, the term doleket has two meanings: one is that the castle was radiating “brilliant light.” But others maintain it was burning, being destroyed by flame. Who is the master of this castle, asked Abraham, that they would build it only to allow it to burn? And so, the midrash goes, he came to know God. 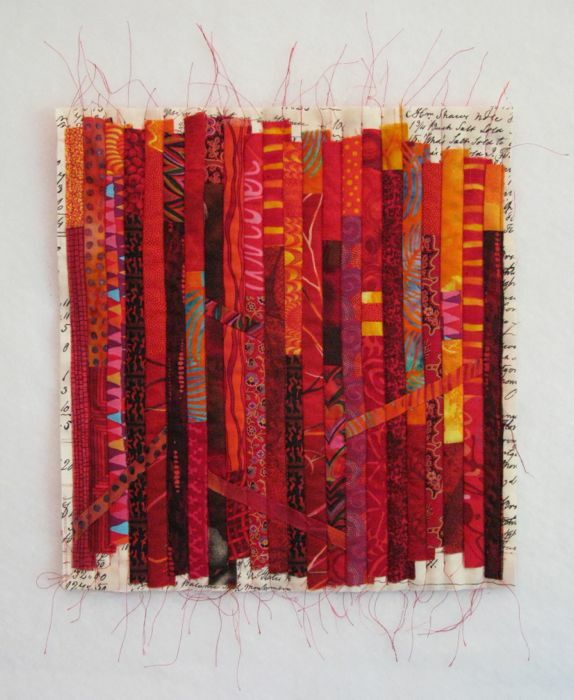 I wanted to convey this idea in my quilt — while something can be in flames, it can also be full of light. So I made the one-inch timbers of this creation stand strong and straight, then allowed some to fall at an angle, denoting fallen beams. I kept the fabric intact, but left the edges ragged, and threads raveling. The body holds together, but is mounted on a fabric with text, as the written word is both permanent and ephemeral. The implications for this idea of doleket are numerous and obvious. We struggle through a searing experience, only to discover new strengths. We recognize that often we make fumbling and brutal mistakes with this life we’ve been given, yet continue to work to make things right. This quilt is less literal than my other two, but I could think about this idea for a long time, and in many of its permutations. 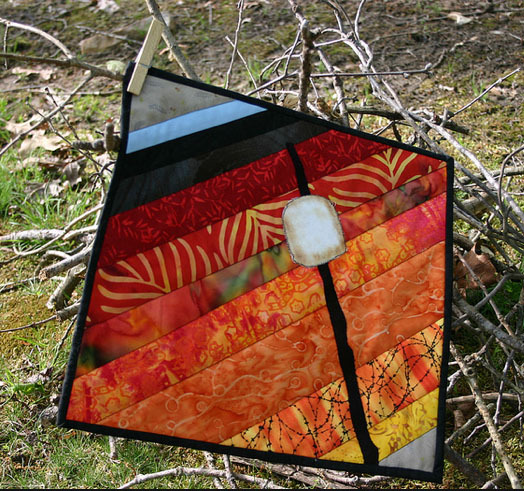 I’m glad I had the chance to think about flame, about fire, and to try to put it into art quilt terms. Check back for the next post, describing some of my creative decisions, a veritable deconstruction of Doleket. This is quilt #113 on my 200 Quilts list. This is just stunning, Elizabeth! Love the raw edges, the backing, the story. Am anxious to read more in the deconstruction! The thought processes that go into your creative pieces Elizabeth blows me away!!! For me it is a learning experience. And I haven’t even got to the quilt yet…. Incredible! I absolutely love this one, Elizabeth. It definitely glows, and the meaning and story behind it are especially cool! I love it too. Fire is such a powerful element, light, heat, life and destruction, all rolled into one. 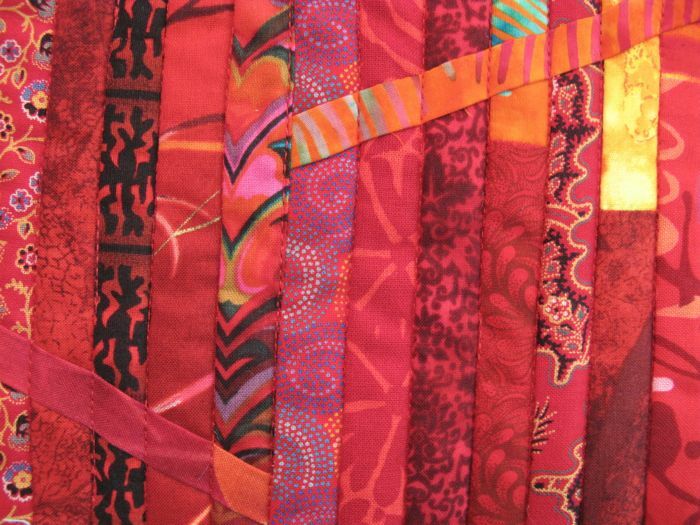 Your quilt is a wonderful reflection of your thoughts. This is stunningly beautiful! Awesome creative process and contributing reflection. Thank you. Holy, Moly that is just fantastic!Thankyou for sharing. I feel like I have seen into your soul. Thank you for being so open and honest with us. FANTASTIC!!!!!!!!!!!!!!!! I really really like this Elizabeth! It looks very 3D and the threads are a great touch. Well done. You also asked about the text prints in Carla’s block. I’ll look it up and let you know. Remind me if I forget. I like the unraveling threads at the end. They remind me of a prayer shawl. You’re kind of awesome. Everything about this is cool, well done! Oh, wow – it’s stunning… I sincerely appreciate the meaning behind it. Your colour choices and the long thread tales add so much. Love it. 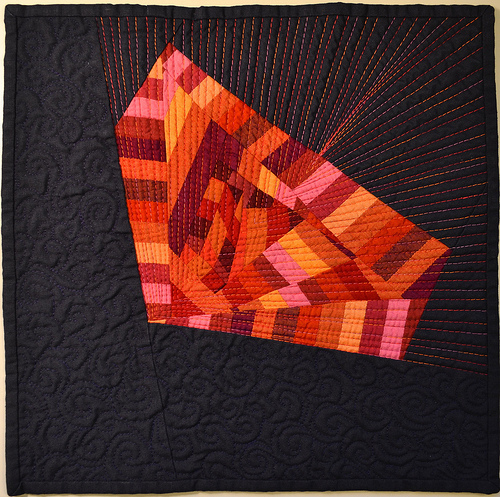 Pingback: Finsh-A-Long–Second Quarter Report | OccasionalPiece--Quilt!